How did we end up with government officials this stupid micromanaging our lives? The U.S Education Department’s Office for Civil Rights has forced a school in Michigan to tear down a brand-new set of bleachers for its boys’ varsity baseball team because the new seating is nicer than the girls’ softball bleachers. 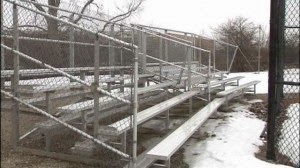 The raised seating deck for the boys’ baseball team, which was paid for with money raised by parents, was put in place because fans who’d come to watch games at Plymouth High School in Canton, Mich., were having a hard time seeing the game through the chain-link fence WJBK-TV reported. The parents installed the new bleachers themselves and even added a new scoreboard to the field, the station reported. But after an investigation by government officials, which was prompted by an anonymous complaint, the school was told it had to remove the new seating because it was “no longer equal” to the adjacent girls’ softball bleachers, which have yet to get a makeover of their own. This proves once again, modern liberalism is a form of insanity. Says a lot about the character of the parents of the girls' softball team players. Whiners, not winners. Is Harry Reid the biggest scumbag in Washington? Who is up for planet Biden? Crash of Malaysia Airlines flight MH370 found? Is the end near for Westboro Baptist Church? Malaysia Airlines Flight 370 was hijacked!